In a recent publication to ChemPhotoChem, a team from Merck in New Jersey, USA, fronted by Dr Emily Corcoran and Dr Francois Levesque, discuss challenges that can be encountered during a photochemical synthesis. 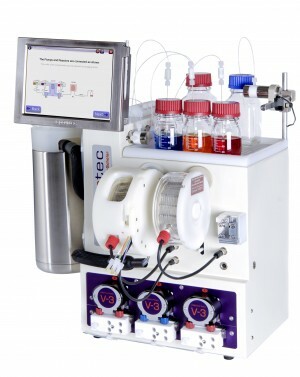 Using two R-Series, both equipped with a UV-150 photochemical reactor, the team solve these challenges, are able to optimise and scale-out a synthesis, and translate the optimal conditions to a bespoke platform. The [2+2] photocycloaddition is one of the most significant methods for accessing the often-useful cyclobutane motif. To that end, the team at Merck trialled a series of batch photochemical reactions using ethene and maleic anhydride but found that the headspace in the batch reactor led to a completely biphasic system and very low productivity. 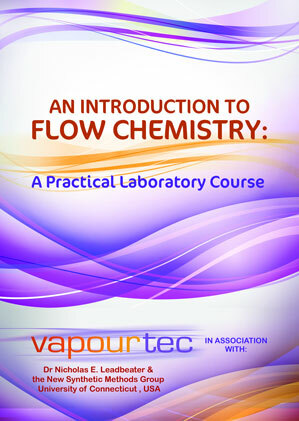 The team turned to flow chemistry; using the Vapourtec R-Series with a UV-150 photochemical reactor equipped with a medium pressure mercury lamp the cycloaddition was carried out with very high rates of production, even in the absence of a photosensitiser. Unfortunately, the team ran into issues when leaving the reaction to run longer; a fouling of the reactor caused significant losses in photochemical efficiency, dramatically affecting the rate of production of the product. Extensive testing found that the fouling was caused by a photochemical degradation product, rather than any interaction with the reactor itself. Using a Vapourtec filter, the team were able to remove the high-energy wavelengths, which their testing had identified as causing the degradation, but were now not sufficiently activating the maleic anhydride to carry out the cycloaddition. By including a photosensitiser, and following small-scale optimisation using the UV-150, the team were able to cleanly produce the cycloadduct without any degradation products. To achieve the rates of production that the group required, the optimal conditions were transferred to a bespoke-built 140 ml photochemical reactor. A lack of pressure capability mean that the reagent solution had to be pre-saturated with ethene, but the bespoke reactor enabled conversions of 85%, resulting in a throughput of 2.4 g/h. The group also wanted to explore the use of efficient LED sources at 365 nm so again used a UV-150 now equipped with a 365 nm LED to explore the cycloaddition further, using benzophenone as a photosensitiser. 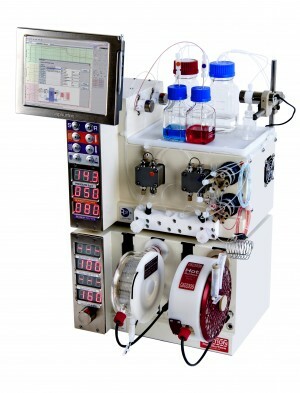 After achieving good productivity, the reaction was scaled-out by using two R-Series together, both equipped with a UV-150 that were connected in series, giving a conversion of 95%, and a throughput of 1.8 g/h. “It is very impressive to see such significant optimisation, and a 14-fold scale up of this reaction” says Dr Ryan Skilton, research scientist at Vapourtec. “The combination of a filter and appropriate sensitiser has enabled Dr Corcoran and Dr Levesque to avoid the degradation of their product by high-energy wavelengths but still achieve high conversions. This paper also demonstrates really well how pressure can be used to increase the solubility of gases in a reagent stream and enhance the reaction rate”.